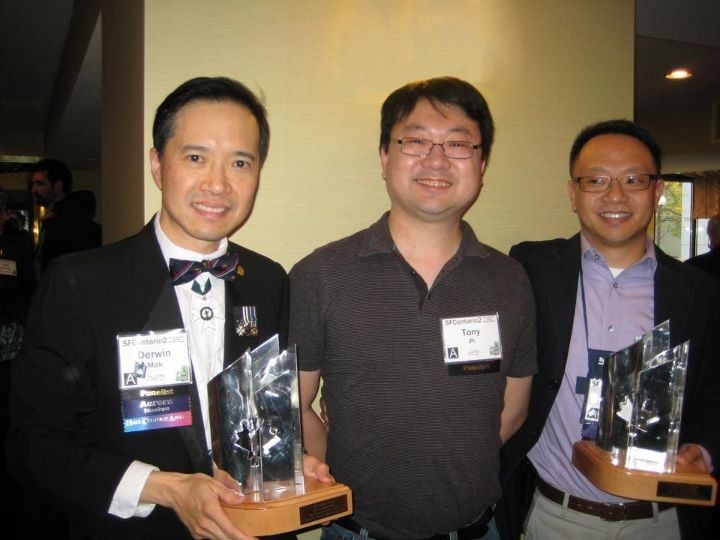 The Dragon and the Stars, edited by Derwin Mak and Eric Choi, won the 2011 Prix Aurora Award for Best Related Work English yesterday! I’m really happy to be part of the anthology. 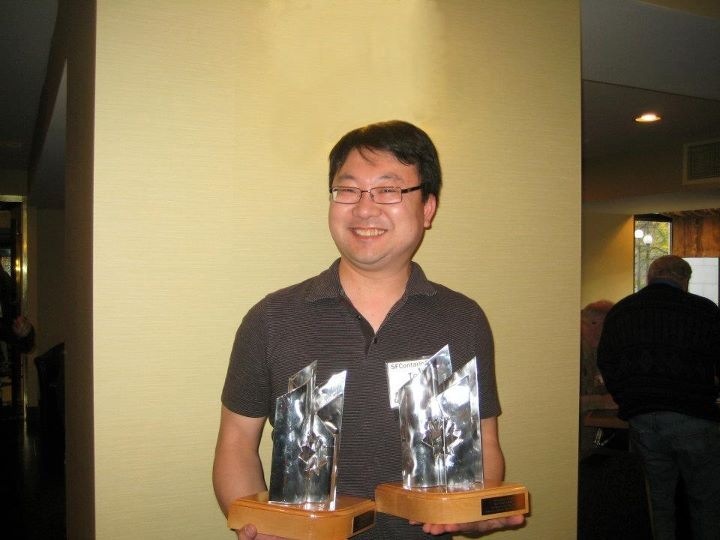 Here are a couple pictures of me at the ceremony, representing the authors in the book and getting to hold the trophies. For the full list of Aurora Award winners, look here. Congrats to everyone! The Dragon and the Stars now has excerpts and full stories online at editor Eric Choi’s website. 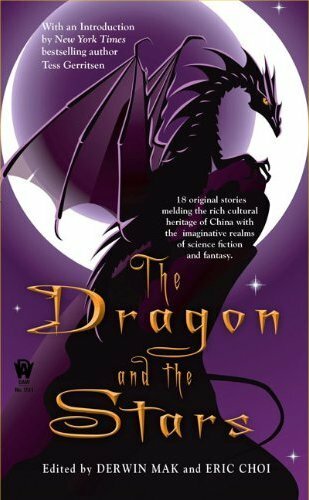 The anthology The Dragon and the Stars, edited by Derwin Mak and Eric Choi, is a finalist for a Prix Aurora Award in the category of Best English Related Work this year. Also, one of the stories in the volume has been nominated for a Sidewise Award (“Goin’ Down To Anglotown” by William F. Wu). Congratulations to them, and good luck! To cheer them on, I’m making available an excerpt from my story “The Character of the Hound”, which appears in the anthology. Read it here. The launch for the anthology The Dragon and the Stars at the Merril Collection, which was quite well-attended. Just seeing the Grand Canyon was incredible, but the best moment of the trip was conquering my fear of heights, forcing myself to walk the entire length on the glass bridge of the Grand Canyon Skywalk. Celebrating our 7th anniversary at CUT by Wolfgang Puck in Las Vegas. The Kobe beef sashimi was simply divine, as was their porterhouse steak. My 40th birthday party at the Duke of York. I’m very thankful to have so many friends come. Walking my mother down the aisle at her wedding. After standing in line for 2 hours, finally seeing Michelangelo’s David in all its magnificence in Florence. Pictures really don’t do it justice. In Italy, meeting my stepfather’s side of the family for the first time and seeing my aunt and uncle from Taiwan for the first time in decades. My Taiwanese uncle and my new step-uncle transcended cultural and linguistic barriers with the help of wine and accordion. Looking up at Mount Vesuvius from the forum in Pompeii, and realizing how incredible it was to be standing in a slice of frozen time. My writing group’s 24-hour story challenge, when some of us gathered at Stephen Kotowych’s house and wrote Writers of the Future-style. I got little sleep but it was worth it.